Post Disclaimer: This post is sponsored by Dr. Harvey's. 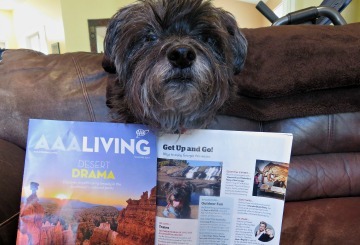 I am being compensated for spreading awareness of Dr. Harvey's line of products but Oz the Terrier only shares information we feel is relevant to our readers. Dr. Harvey's is not responsible for the content of this article. 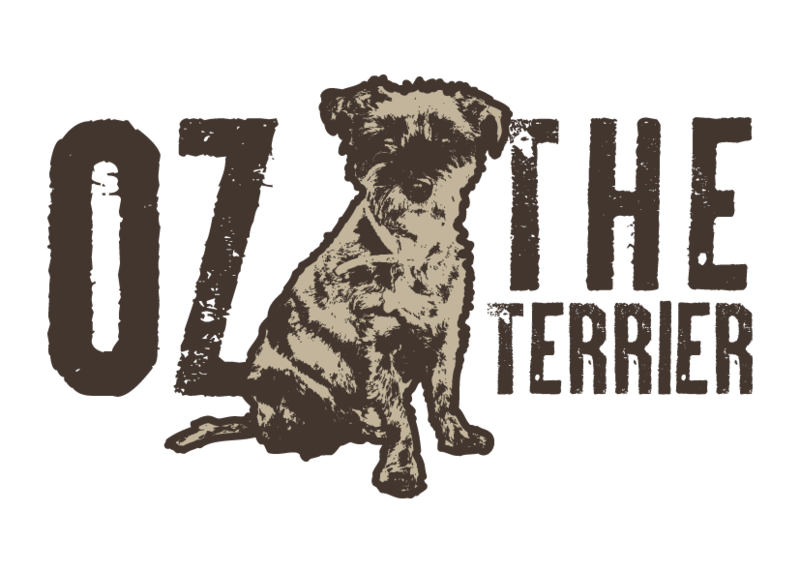 It is a privilege for me, Dr. Oz the Terrier, to tell you about some fine, all-natural health food for your pet by Dr. Harvey's. The team at Dr. Harvey's has dedicated themselves over the past 30 years to helping pet parents give their pets a better, healthier, happier, longer and more fulfilling life. How do they accomplish that? 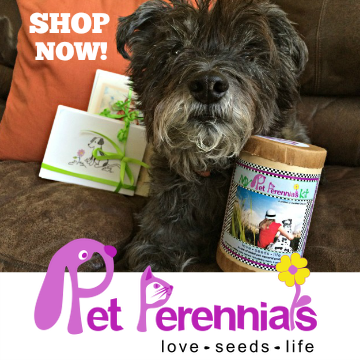 They produce some of the finest all-natural foods, treats, herbal supplements and herbal grooming aids. Their products are fresh, organic and holistic and they contain no added chemicals, no preservatives and no synthetic additives nor colorants. 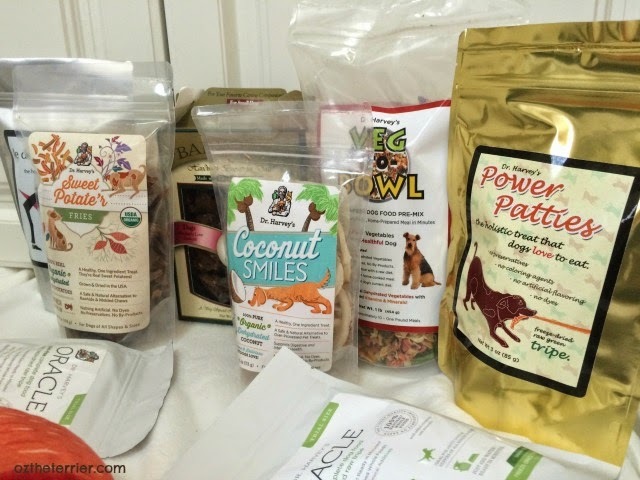 I was recently given the opportunity to try many of Dr.Harvey's food and treat products and I can not only agree they are all-natural and healthy, they are delicious as well. Sit back, relax and let me share my experience with the Dr. Harvey's products I received. Power Patties are freeze-dried, raw green tripe. Green tripe is the stomach of ruminating animals which has not been cleaned and thus contains the gastric juices and enzymes of the source animal. It is highly palatable and easily digestible for pets and it provides necessary amino acids and essential fatty acids. 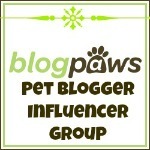 Green tripe is great for pets with digestive issues as it helps settle a pet's stomach. These are some of my favorite Dr. Harvey's treats! We always have a bag or two in the house. The ingredient list for these treats is short: Freeze-dried beef green tripe. That's it. Delicious and healthy! If you are a lover of all treats stinky like me then look no further than Dr. Harvey's le dogue bites freeze-dried fish. These little squares of deliciousness are the perfect size for a little snack or for training. Again the ingredient list is short: Freeze-dried cod. Le dogue bites also come in Chicken or Beef with the respective ingredient list being Freeze-dried chicken or Freeze-dried beef. I cannot get enough of these tasty and fun treats. 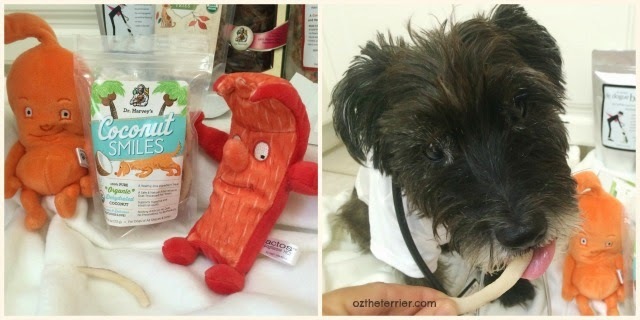 These treats will surely make you and your pet parent smile. 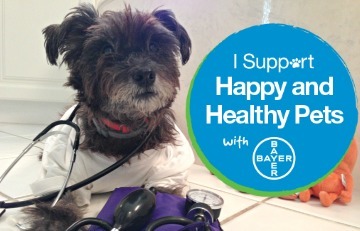 Coconut Smiles are crispy, delicious treats that are chock full of nutrients to help keep a pet healthy. The only ingredient: Dehydrated Organic Coconut. 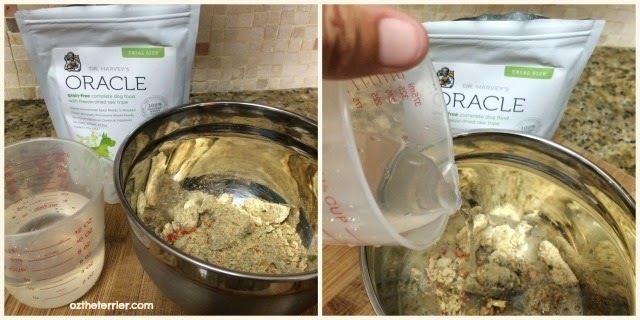 Oracle has all the health benefits of a fresh, homemade meal in a "just add water" formula. It is made with high-quality protein and other natural ingredients that provides vitamins, minerals and other essential nutrients. It comes in Regular and Grain-Free versions with either Chicken, Beef or Tripe. 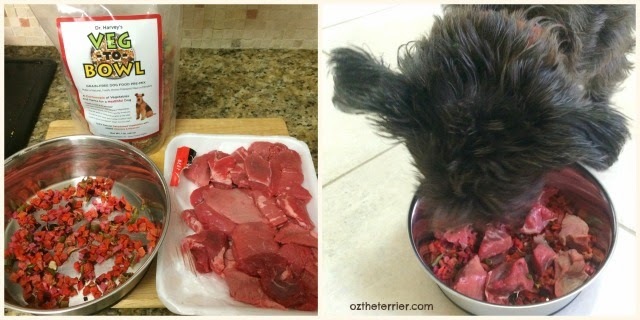 I received the Oracle Grain-Free Freeze-Dried Tripe and let me tell you, it is delicious. Ma followed the easy instructions on the package and just added water. After about 10 minutes, it was ready to eat. Now, Ma added the recommended amount of water and it came out like loose oatmeal. I prefer my food a little "tighter" so the next time she made it, she added less water. Either way, it was so tasty it was gone in seconds. What does a vegetable premix have to do with raw meat? Well, the Veg-to-Bowl, a grain-free nine vegetable premix can be added to either a raw meal or a home-cooked meal. That's right, you do not need to be on a raw diet to eat Veg-to-Bowl. You can have your pet parent cook you up your favorite protein and add these healthy and delicious veggies to it. Veg-to-Bowl is easy to make: first look at the included Feeding Guide for the amount you need, then just add the right amount of hot water and let the veggies rehydrate. Add your favorite oil and meat and you have a fancy meal. I loved it with some raw beef cubes...so much so, I tried asking for a second helping! There you have it! A little "taste" of information about each of the Dr. Harvey's products I received but these are just a sampling of what Dr. Harvey's has to offer. 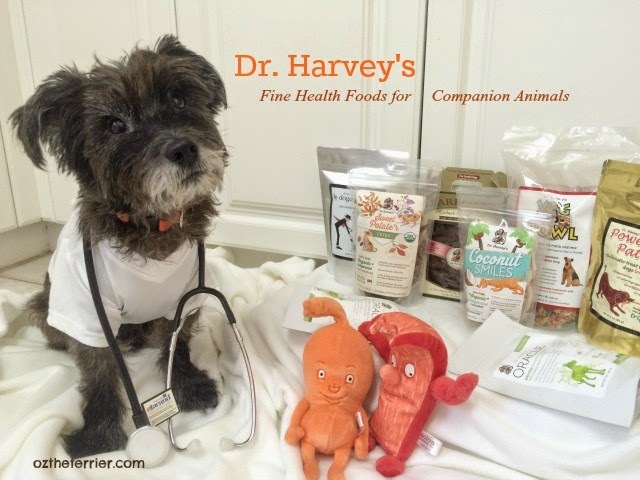 The team at Dr. Harvey's makes their fine health foods for cats, birds and horses as well! and by following them on their YouTube, Facebook, Instagram and Twitter accounts. 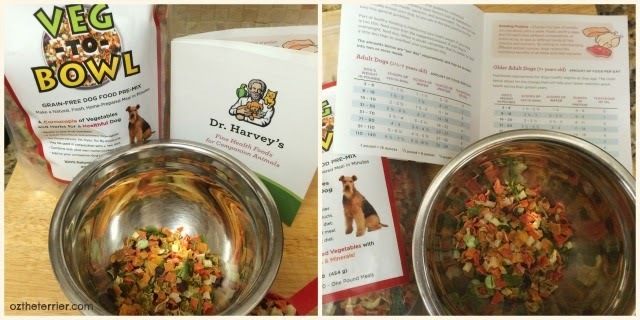 Have you tried any of Dr. Harvey's delicious food or treats? If not, which one would you want to try first? Oh yum, yum, yum, drool, drool, oophs, that's a very soggy keyboard! Ohhh, the freeze dried cod treats look like the small perfect size for training. It's been so hard finding good sized treats for training that I don't have to cut, which gets annoying. I may try these! Oh my, it's puppy heaven! 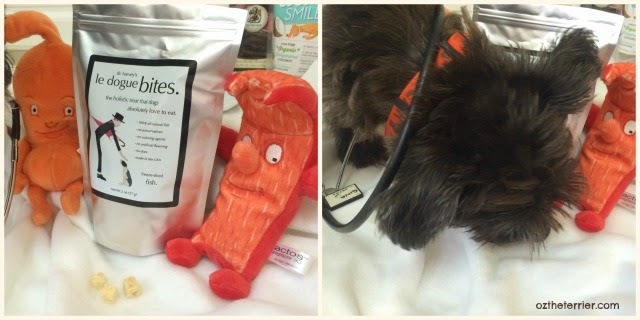 We have recently had the same pleasure of trying out various Dr. Harvey's products, and the pups love them all! 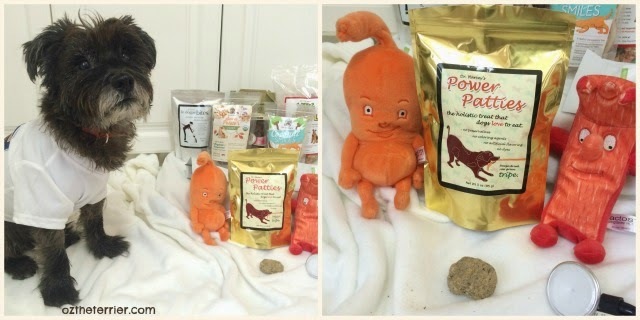 We started incorporating the Veg-to-Bowl into our homemade puppy diet about a month ago, and the pups are loving it! I had always been wanting to try feeding a homemade diet, but thought that it would be extremely time consuming and wasn't sure about the protein-vitamin-nutrients ratio...enter Dr. Harvey's Veg-to-Bowl, making it a piece of cake! 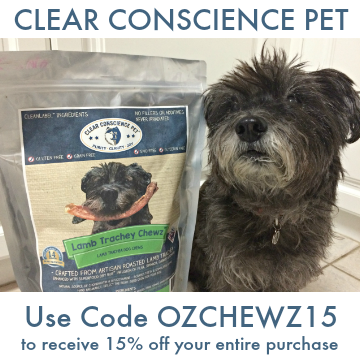 We are licking the screen...oh those coconut treats looked so good...great job Oz. Wow!!! We are not familiar with Dr. Harvey's but we have to say we are very impressed! We'd probably tried the coconut smiles! Thanks for sharing! Gosh, I've never heard of Dr Harvey. Where have I been?! 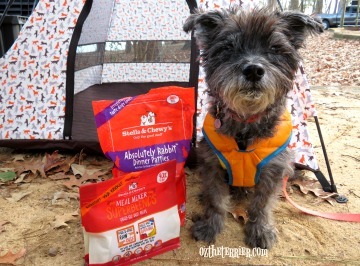 I would love to try the coconut treats, oracle freeze dried dog food or the sweet potato fries. Everything sounds amazing! My house has a dog (who needs gluten free foods) and our pet rats (who will pretty much eat anything). I always love to find snack foods that the dog and the rats can share. We're going to have to take a closer look at those coconut smiles and the veg to bowl. If all doctors wuz as cute as you Oz, my momma would not mind goin so much. YUM! Those all look good. Luna would probably be most interested in the Sweet Potato Fries and Coconut Smiles. We haven't tried anything from Dr. Harvey yet, but it might be about time! We never heard of them before but their stuffs sure look delish! We have never tried any of these, but my sisters and I would be all over the power patties. We used to get treats like that in Germany and they were so tasty! 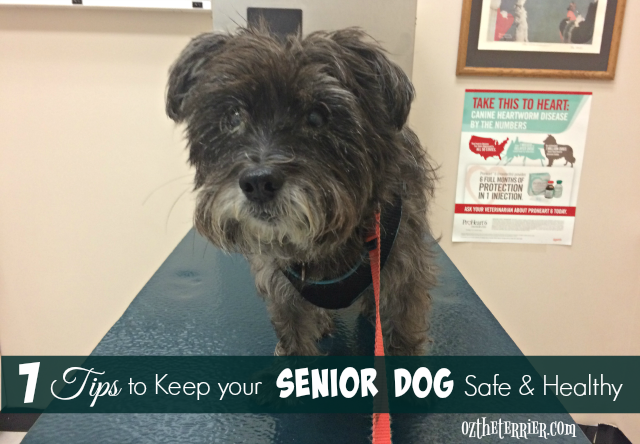 Hi there, I haven't heard of Dr. Harvey's treats or food before; this is great information. 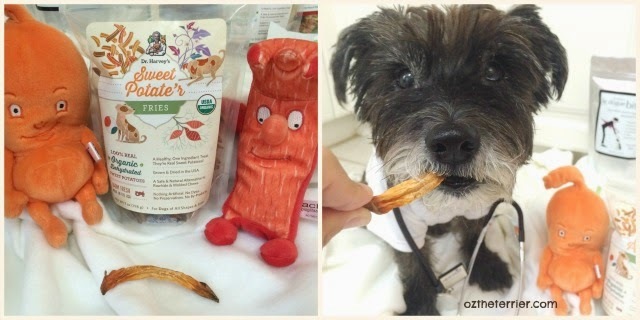 If I was to get Hunter one of these products, it would have to be the Veg-to-bowl or the coconut treats. Thanks for such a great review; I'll have to check at our local store to see if they carry it. Great job Oz! It looks like you have been a busy bee trying all of these yummies! We can't wait to try some of these goodies! Wow, love the little stuffies hahaha!!! No, I have not tried any of this yet, but I am definitely going to check it out now! Thanks Dr. Oz! I love Power Patties! 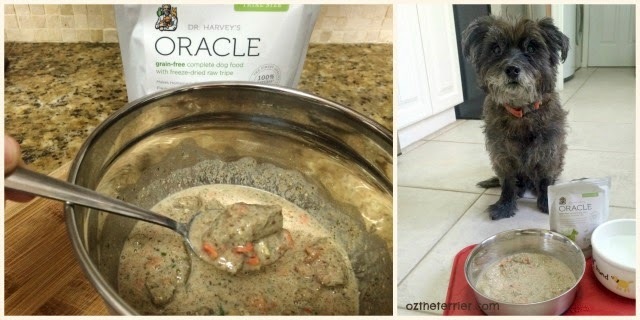 Dr. Harvey's Oracle is how I made the switch from kibble to raw. Those Coconut Smiles look fun & yummy, I will have to bark at Mom to get some for me! That's a whole lot of goodness, those coconut smiles look fun and tasty - hahaha I see pepper pom thought so too. That all looks super yummy. I like the idea of healthy treats. I bet brown dawgs would love the Coconut Smiles.